Lieutenant R.M. Carr, the only son of Mrs. Carr and the late Rev. 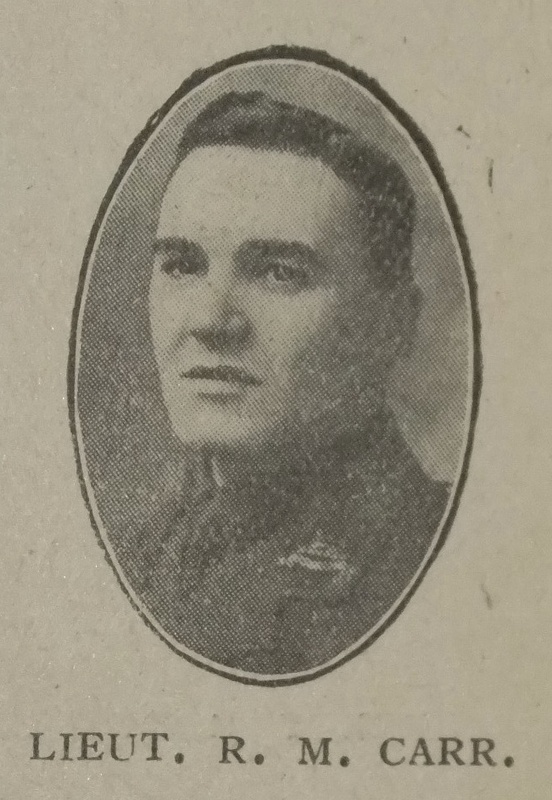 Robert Carr, was killed in action on May 29th, 1918. His death, most deeply felt by his mother and fiancée, was a great blow to his friends, and sad news to those who had known and esteemed his father. He was educated at Elmfield College, where he matriculated, and afterwards proceeded to Bourne College as an assistant master. While at Bourne, he decided to enter the ministry, and with that in view, took up work as a H.L.P. on the Newton Heath Circuit, Manchester. Soon after entering Hartley College, he doubted whether the ministry was his true calling, and at the end of his first year left to resume teaching. He taught at Southsea, Herne Bay, and Hinckley Grammar School, Leicester, and during these years gained the London B.A. degree. Besides his school work, he found time for preaching. He also taught a class at 7.30 a.m. on Sunday mornings at the Adult School. On Sunday evening, June 23rd, a memorial service was held at our Hinckley Church, and was attended by all the boys from the Grammar School, together with the Headmaster, the staff, and the Chairman of the Governors. Lieut. Carr inherited from his father great earnestness and a passion for the truth, and if, like his father, he at times felt uncertain in his religious faith, it was evidence of his absolute genuineness. He owed much to his mother, who remains the most loyal of Primitive Methodists. Robert was Temp Lieutenant in the Lincolnshire Regiment.